Oh yes I did... :) These little Christmas tree dog treat towers are assembled with carob "glue" and decorated with carob and yogurt. They are a very cute little gift to make and gift to all of your favourite furfriends this holiday season. Here's how to make your own! 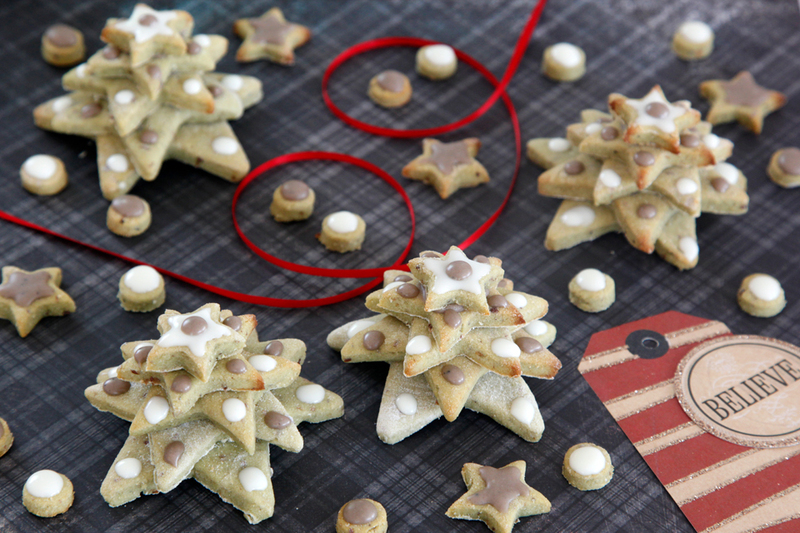 You will need a set of star-shaped cookie cutters or other graduated cutter, like snowflakes or even ordinary circles. 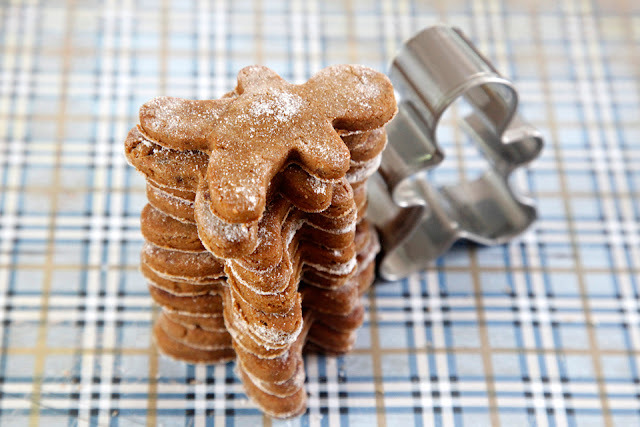 If you're feeling extra fancy, there are even special Christmas tree stack cookie cutter sets! A couple of small squeeze bottles or similar are very handy for working with your melted carob and yogurt as well. Remember to take care when shopping to avoid artificial sweeteners in ingredients for your dogs - xylitol is particularly dangerous for dogs. You can use any roll-and-shape treat dough that you and your pup would enjoy to make the biscuits for these treats, and if you wish, you can even use a green food colouring, but natural looks great as well. I think these would be fabulously festive with a doggy gingerbread. Roll and cut into star shapes, making sure that you have the incremental sizes for stacking, and bake according to your chosen recipe. Dehydration is optional, but can help create a crispier treat and a little longer shelf-life for the treats without freezing (although freezing is a-ok too). Ensure your treats are fully baked and cool before beginning your towers. I experimented with a kiwi dough to see if I could get a natural green without turning to artificial colouring or green veggies. Veggies and carob? Bleuch! Although I'm sure the dogs would still love it! I didn't want to go crazy with the kiwi, so used it along in combination with banana and other add-ins. The dough was a lovely minty green but baked up to a muddier greenish brown...which I should have expected. Fail! Oh well, live and learn! The dogs loved it all the same. :) For anyone interested, the experimental dough mix was: 3 peeled and pureed kiwi fruit, one ripe mashed banana, 2 tbsp applesauce, 2 tbsp peanut butter, 1/4 cup coconut flour, 1 cup rice flour (adjust if/as needed as fruit size and water content will vary) baked at 180C for approximately 12 minutes and then dehydrated. Pre-chill your prepped stars. This is optional, but will accelerate the setting of your "glue" and ornaments to reduce the risk of running. Combine roughly equal portions of carob drops/melts with peanut butter. Melt and pour into your squeeze bottle and place in a hot water bath to keep liquid while you work. The bath is optional, but lets you work slower if needed. Carob drops can be tricky to melt compared to chocolate, as the carob is usually drier/lower fat. Combining the carob with the peanut butter and gently melting them together can help. Individual carob and peanut butters may vary, but in my experiences to date equal roughly equal measures set to a firm fudgey solid texture. You can use a little less if you want a harder set or swap in a little coconut oil if you need a runnier liquid. Melt yogurt drops/melts, pour into your squeeze bottle, and place in a hot water bath to keep liquid while you work. The bath is optional, but lets you work slower if needed. Unlike carob, yogurt drops/melts are generally pretty free melting and flowy, but you can add a little coconut oil needed for melting or to thin to a runnier liquid. Just a little, else your liquid may become too runny for decorating and/or might not set firmly. Working from bottom to top, use your melted carob or yogurt as glue between your star layers. Not too much - you want to hold the trees in shape, but will also want to pop them apart for smaller treat eating portions later. Rotate the stars into an offset position as you stack. 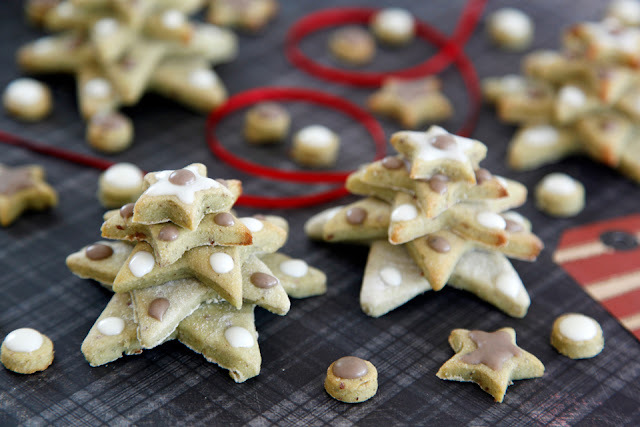 Decorate with additional carob and yogurt. 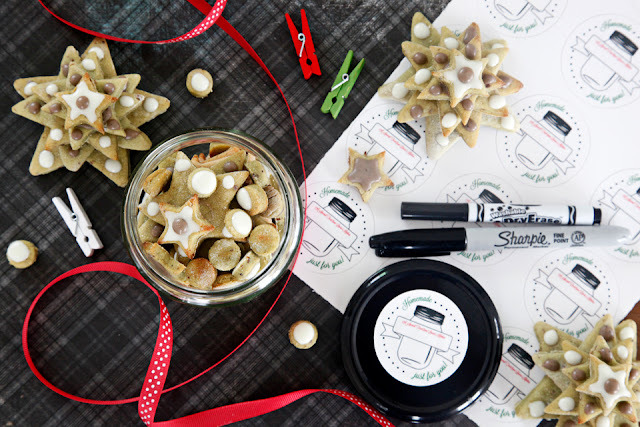 Decorate extra stars and shapes as well, if you wish. If you are prepping your holiday gifts and would like to fancy things up, check out Kidecals, like the pawesome wash-and-wear labels pictured below. If you'd like to try Kidecals for yourself, you can use coupon code summersavings (don't be too jealous, but it's summertime down here) at check out to save a tidy 15% on your purchase. In addition to treats, Kidecals would be awesome for labeling kids' school, sports, club, and travel gear, but don't let that stop you from using them for other needs, like we did with our emergency tags. Disclosure: Discounted Kidecals products were provided for my use on a no-obligation basis. Opinions provided are my own and are an honest representation of my user experience. We have a Christmas post for you every weekday between now and the start of our offline holidays, with toys, decorations, treats, and more so stay tuned! See you again on Monday, furfriends! We had a great question from a reader on Facebook following a later recipe post about where to find yogurt drops/melts. They can be tricky, unfortunately, and I thought I share my reply here for anyone else having trouble. On the flip, if any readers have favourite sources or brands, feel free to share. :) Thanks! Your local bulk goods or specialty food shops may carry them, but many don't. Depending on where you live you can try a big online retailer like Nuts.com or Amazon, and some pet suppliers sell doggie yogurt drops much like doggy carob drops. Don't be too worried if you can't get them though. I only use them very occasionally and sparingly - when I say they're naughty and for occasional indulgence only, I'm not exaggerating. Meltable "yogurt" drops/chips/melts/coatings (both human and doggy) are more like white chocolate or candy than healthy real yogurt, with lots of sugar and oils and very little good stuff. Check the ingredients to make sure there's at least some dairy not just pure candy badness. For anyone wondering, yes, many carob drops/chips/melts are also high in oils/fats and sugars. I'm often surprised by what's on the labels. Moderation is key.